Energy Focus created the first retrofit LED tube solution for the U.S. Navy, but since then we’ve expanded to selling our military tough LED products for schools, hospitals, shopping centers, and more! But, what exactly is a retrofit LED tube? We’re glad you asked! A retrofit is an added component or accessory to something that did not exist when it was manufactured. Fluorescent fixtures were meant to house only fluorescent tubes but Energy Focus has created an LED solution that is compatible with existing fluorescent fixtures. The best thing about Energy Focus LED tubes is that all of Energy Focus LED tubes can be retrofitted into your existing fixtures! 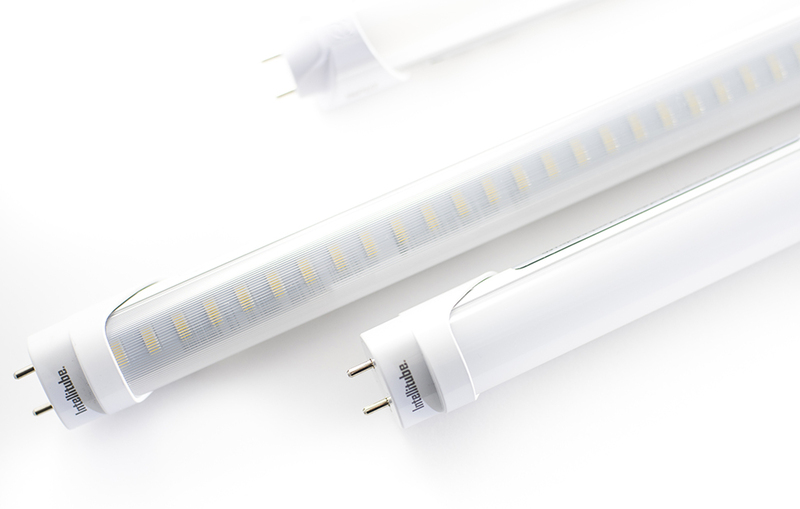 Our most popular LED tube to date for retrofitting applications has been the Intellitube®. Why? Because the Intellitube® is categorized as UL Type A/B, giving companies a choice on how they want to complete their retrofit. An Underwriters Laboratories (UL) Type-A installation, also called a direct-fit installation, simply means that you pop the fluorescent tube out and replace it with the new Intellitube® LED tube. Energy Focus provides a ballast compatibility sheet as a reference. There is no rewiring necessary and a retrofit can take place very easily, depending on the size of your space and location of the fixtures. This is the easiest way companies can begin saving money with more efficient LED tubing with the smallest amount of hassle. However, there are some downsides to this installation. You are still using a ballast for the power source. If the ballast should fail, the light will go out. The best thing about the Intellitube® is should this happen, you can remove the ballast and install the tube as a UL Type-B and the same LED tube can continue to be utilized! Most Energy Focus products require a UL Type-B installation, also called a direct-wire installation, such as the RedCap™, 500D series, and the Commercial T5HO. Simply put, this means directly wiring the power source to the LED tube through unshunted lampholders, instead of running it through a ballast. Ballasts are not required for LED tubes and removing them can save a company an additional 5 watts of energy. The ballast removal and rewiring of tubes do require a little more work initially, but the LED tube is not dependent on the health of a ballast to operate. In all cases, if a company is able to install UL Type-B LED tubes during their retrofit, they will see a return on their investment in energy savings in as little as 2 years. If you need assistance choosing which LED product is right for your retrofit needs, fill out the contact us form and a customer service agent will follow up with you. Now that you are ready to choose your type of LED retrofit installation, view the video above for some safety tips when installing your new Energy Focus retrofit system!